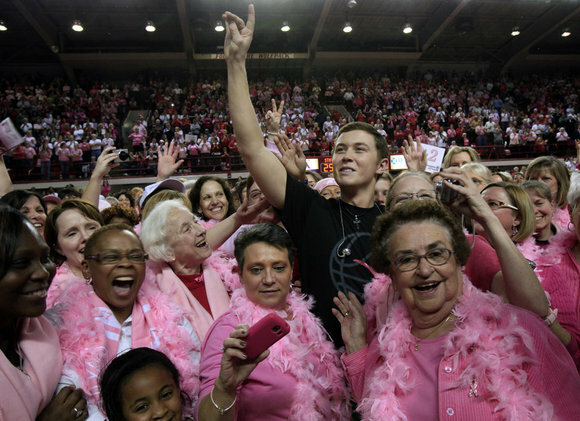 Cancer survivors surround Scotty McCreery, an American Idol singer from Garner, after he performed "I Love You This Big" during the halftime at the seventh annual Hoops 4 Hope game between N.C. State and Wake Forest at Reynolds Coliseum on Sunday, Feb. 12, 2012. 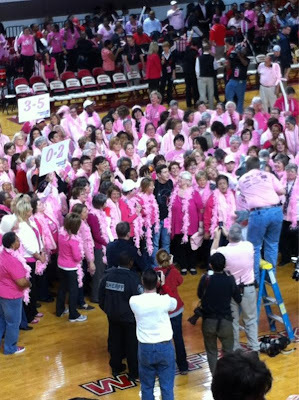 RALEIGH -- Some in the sea of pink t-shirts at Reynolds Coliseum Sunday night came to see a scrappy women’s college basketball game, some to support cancer research, some both. And this time, some at the annual Hoops 4 Hope event at N.C. State University had also come to see Scotty. 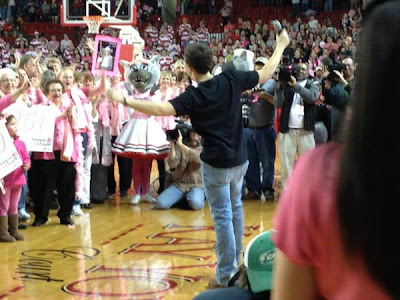 Scotty McCreery, it turns, out, loves drawing attention to breast cancer -- to borrow one of his lyrics -- “this big.” The rising teenage country star from Garner helped draw a sellout crowd of 8,500 to the event, which builds awareness for breast cancer, honors survivors and raises money for the cancer fund that bears the name of former NCSU women’s hall of fame coach Kay Yow, who died of the disease in 2009. The NCSU women, as has become tradition, wore pink uniforms instead of red. Visiting Wake forest went for pink socks to set off their black uniforms and the same flashy pink-and-silver sneakers as NCSU. 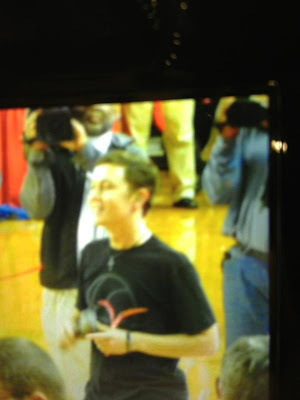 In another tradition at halftime, the event’s real stars flowed onto the court. More than 150 breast cancer survivors -- many of them guests of event sponsor Rex Healthcare -- took the floor to the cheers of the crowd. 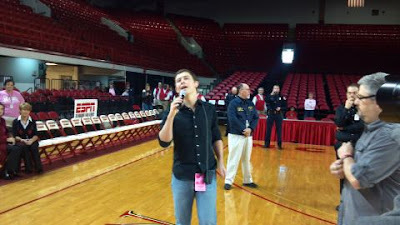 Then the young “American Idol” winner walked out and serenaded them with his hit “I Love You This Big.” Afterwards he posed for photos with the survivors, signed autographs and circled the court throwing pink t-shirts into the balcony seats as the crowd screamed. The women on the court enjoyed their own star turn so much that an announcer eventually had to ask them to clear the floor. Nearly all left beaming, some them still bald from their latest round of treatment. That moment in the spotlight, and that focus on cancer was what the heart of the event, said Wendy Kapadia of Cary, a survivor of four bouts of cancer, including two battles with breast cancer. Yow’s presence is still so strong in the building three years after her death that the crowds roar when her name is mentioned. And given that charismatic former men’s coach Jim Valvano also died from cancer, the disease feels like a family responsibility for Wolfpack fans like Kapadia, who along with a host of family members, graduated from the university. 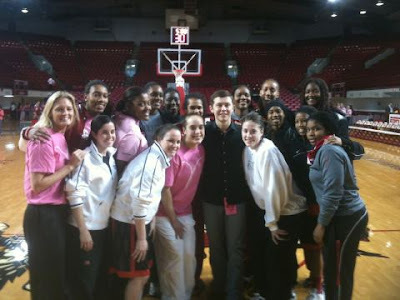 “What happened with Yow, that touched everybody, and of course Valvano, too,” she said. 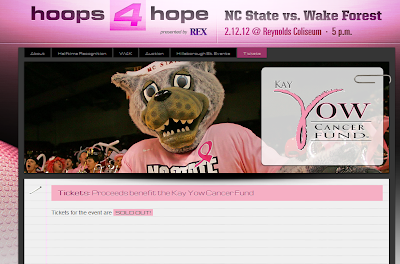 It was the seventh year the NCSU women’s team has held a Hoops 4 Hope game. 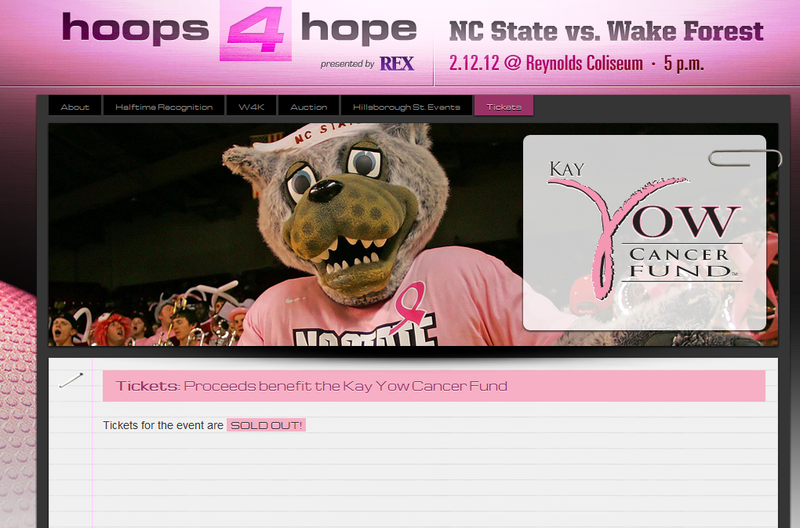 The events are always a bigger draw than typical games, but the only other one to sell out was that in 2009, just weeks after Yow died. The event raised more than $50,000 last year for Yow’s charity to help fight the disease. That fight is important even to season ticket holders like Anna Sullivan of Hickory, who would have come for the basketball game anyway. 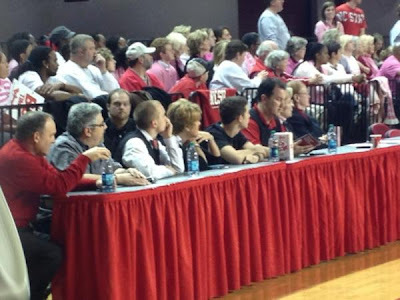 Sullivan arrived nearly two hours before the game with her daughter, Michelle, who lives in Raleigh, so that they could wander among the tables of donated items for a silent auction. They bid on several items, including NCSU sports memorabilia signed by 1970s basketball stars David Thompson and Tommy Burleson. The money, Sullivan figured, would be properly used. To view the photo gallery, click here and click on the 'gallery' tab. 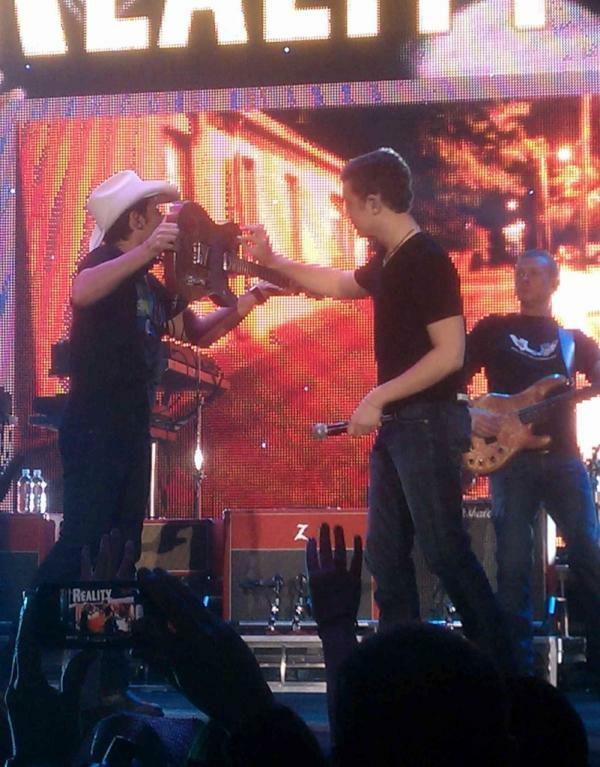 In what will probably be the biggest country show of the year, Brad Paisley, The Band Perry and Scotty McCreery delivered a dazzling show at the Tacoma Dome Saturday. Called The Virtual Reality Tour, it contrasted the reality of everyday life embodied by country music with the "virtual" reality of a Carrie Underwood hologram singing with Paisley. McCreery and The Band Perry could have held down the crowd on their own, they were that good. 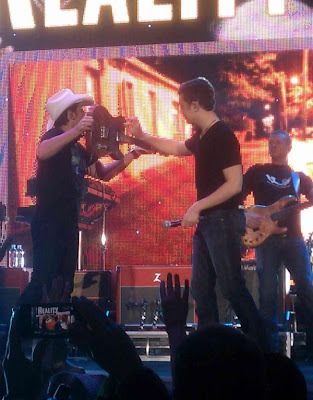 McCreery joined Paisley for the latter song, which featured a cartoonish, tabloid-style video asking, "Is Scotty McCreery Brad's Love Child?" "When you're a celebrity, it's adios reality," Paisley quipped. 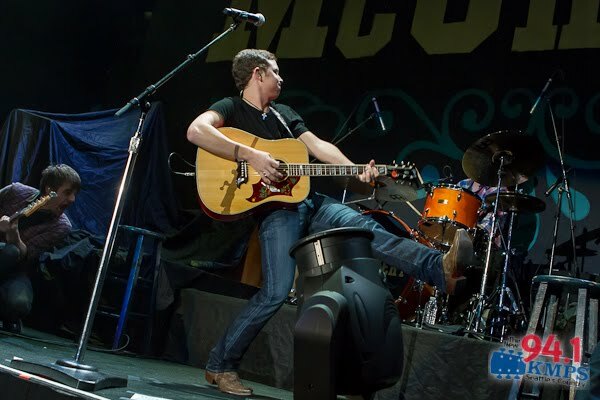 McCreery's rich baritone brought squeals from female fans, especially during the song "The Trouble With Girls." "Water Tower Town" offered a vivid portrait of rural America. I'm just adding this video on this post since the review is about this show! 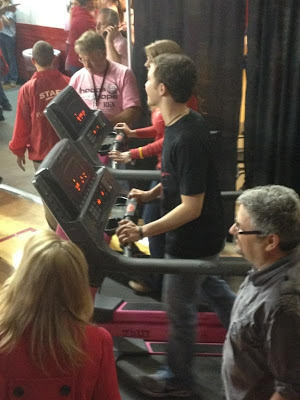 According to tweets coming in, Scotty did another incredible job as expected! 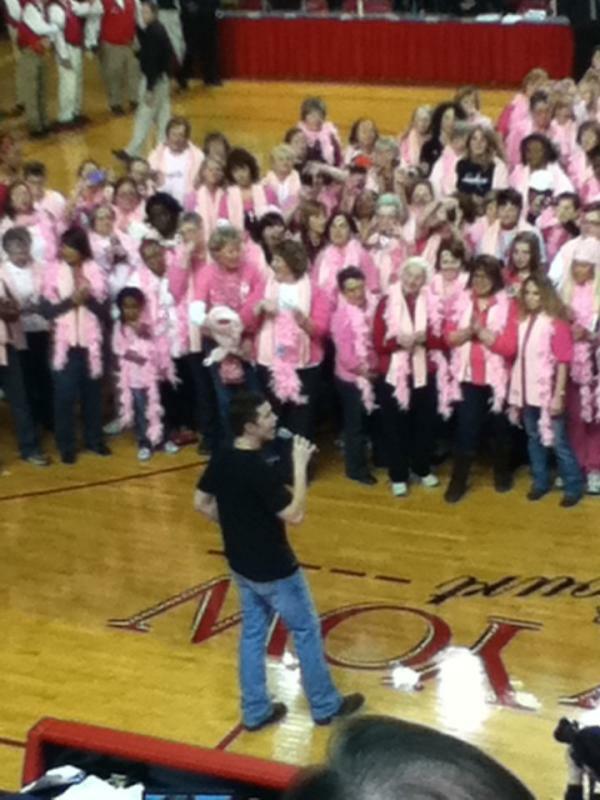 He sang I Love You This Big, dedicating it to breast cancer survivors. Scotty singing to the cancer survivors at the NCSU Hoops4Hope event! 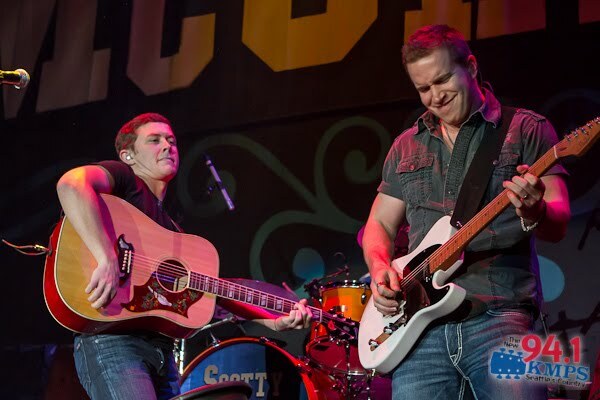 Scotty's back in North Carolina performing for the Hoops for Hope benefit. Here's more info about where you can watch the game. 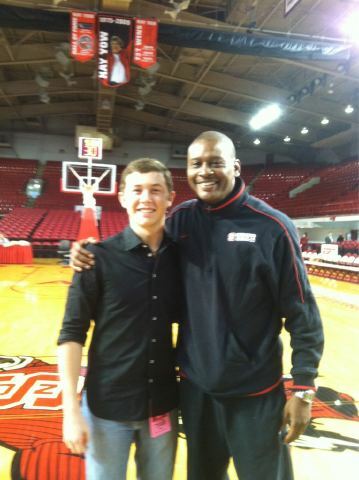 Hoops for Hope at NC State. Meeting the Wolfpack Team. 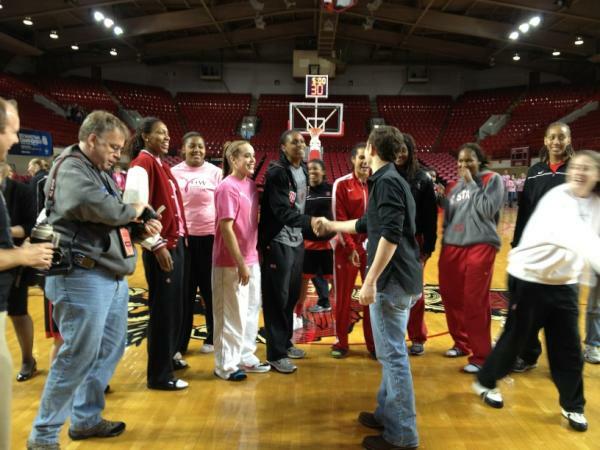 Meeting the LadyWolfpack b4 Hoops4Hope. ESPN2 5pm! The 2012 Academy of Country Music Awards are not set to air on CBS until April 1, but there is still some news coming out worth discussing -- the selection of the Best New Artist nominees. 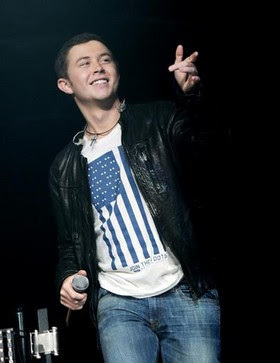 Of the group, one name will especially ring familiar to TV fans -- Scotty McCreery. The "American Idol" champion is joining the likes of Brantley Gilbert and Hunter Hayes on the nomination list, and thanks to his rather large fan base he has a pretty good shot of winning once the fan voting begins on March 19. Scotty already won the award for New Artist at Fox's American Country Awards last December, and his debut album "Clear as Day" is Certified Platinum. As for when Scotty will make the traditional appearance by a winner on "Idol," stay tuned -- we'll probably find out soon.